I can't believe it's already February! Last month just flew by like a mist, or perhaps a blizzard! Love is in the air as Valentine's Day approaches, and I love heart shaped foods, and nearly all things pink and red. This year I started making Valentine's theme lunch a little later than expected and I hope to pack at least one or two more themed lunches. You can find my previous years Valentine's Day lunches HERE. 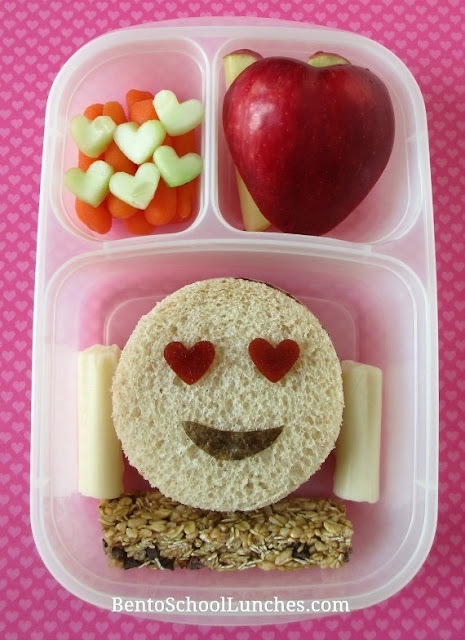 In this bento lunch: Emoji sandwich with fruit leather heart eyes and nori smiley mouth. Below and alongside are a granola bar and cheese sticks. In the other sections are organic baby carrots with heart shapes cut from cucumber, slices of apple one of which made a nice red heart shape. This lunch is packed in an Easylunchboxes container. What a cute Emoji lunch! I love the apple heart!! So beautiful apple heart , Thanks you for sharing . . .